Writers, senators, mayors, journalists, analysts, leaders of humanitarian organizations, UN officials, artists and social entrepreneurs, including Naomi Klein, the Aga Khan, and our very own Richard van der Laken, gathered in Toronto last week for the first edition of 6 Degrees, two days and three nights of cultures, debate and dialogue on inclusion and citizenship in the 21stcentury. 6 Degrees was initiated by the Rt. Hon Adrienne Clarkson, former Governer General of Canada, and her husband, the writer John Ralston Saul. After stepping down from office Clarkson, who as a young child immigrated to Canada from Hong Kong, founded the Institute for Canadian Citizenship (ICC). This organization inspires Canadians to be inclusive, embrace fresh thinking, practice active citizenship, and own their collective culture and spaces. 6 Degrees is meant as a response to the fact that societies everywhere in the world tend to get less, instead of more inclusive these days. 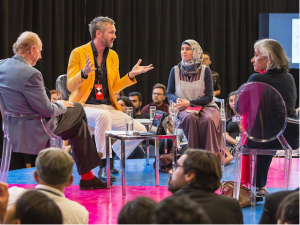 The gathering ‘brings thinkers, doers, artists, politicians and civil society leaders together to talk about what is really happening in the world’, the website states. ‘This was not a conference with talks on a stage,’ says Richard. ‘Instead, we were brought together in different settings of discussions. Thinkers were put together on a round stage in groups of four surrounded by the public to discuss one of the conference teams Exodus, Inclusion and Prosperity. As panel members we had to give a statement of three minutes on the theme, on which eight so called “interveners” on the first row could respond. Sometimes the public could react as well. ‘There were also coffee table discussions in which we sat with eight people around a table to react on statements, called “provocations”. Afterwards we had to share our conclusions with other tables. All this worked extremely well. It was a great opportunity to meet with lots of interesting people. But it was also a great exercise for the brain and an excellent opportunity to form an opinion around the issues at hand. For me it was specially enlightening to experience how much Canada is ahead of us all when it comes to inclusion and citizenship.